Early each spring, just as the blush of new life begins to show in the Vermont countryside, sugaring time starts at the Robb farm. Charlie Jr. collects the sap and then the sap’s slowly boiled down the traditional way, with a wood-fired arch. Our maple syrup is the perfect match for pancakes, waffles or ice cream. For the 2011 season, we issued a new logo, that was once Great Grandpa Betterley’s label (circa 1890), for our syrup products. Designed in a vintage print style, the logo features two men gathering sap with traditional collecting buckets and a yoke carrier with a sugar house and maple orchard in the background. The Robb Farm produces 100% pure & natural maple syrup with nothing added, free of contaminants – that means, no formaldehyde, pesticides or chemicals. 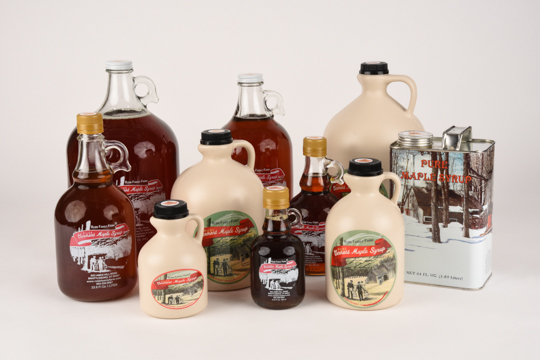 The Robb Family has been maple sugaring for generations, practicing sound woodland stewardship, taking great pride in the hard work required to bring you the very finest pure maple syrup. The sugarhouse is a special feature of this six generation farm. Built in February 1998, to replace the old 1920’s sugarhouse that “gave up”, it was decided to make it a little more accessible to the road. We are ramping up our operation from 2200 taps to 8500 taps. We have also converted part of the old milking room into a kitchen where we will be making all of our value-added products such as maple candy, maple ice cream and maple coated nuts. Our three grades of syrup will meet anyone’s taste. Dark Amber: This hearty syrup is deepest in color and strongest in flavor of all. Now featuring glass jugs with our own vintage label that was once Great Grandpa Betterley’s label (circa 1890). Contact us for prices of various specialty bottles. Place your order today! Why Buy Local, Naturally. Raised Beef? The top four beef packers in the country control 80% of the market. Beef essentially comes from a factory now, not a farm. Our cattle are pastured, not raised in feedlots. They are not fed any grain. Because they are eating their natural diet their bodies are given the time to mature naturally which is less stressful on the animals bodies. Naturally grown beef is healthier for you and your family. The fat content is about 25% lower in naturally fed beef than in typical grain feed cattle. Eating green plants (grasses) also make the meat high in omega-3 fatty acids and conjugated linoleic acid. We do not use growth hormones or steroids. At the Robb Family Farm we have made the commitment to raise and care for our animals and our land in order to provide the freshest and healthiest product to the families of our community. We ship UPS standard delivery. If you require a quicker delivery time please contact us so we can accommodate your needs.